Fun and non-judgmental. It’s ok if you can’t touch your toes or do that backbend/arm balance/inversion, because we are all here to get stronger and more flexible together. Aileen used to be a non-believer who thought yoga was boring. However, things changed after she took her first Vinyasa flow class when based in Yangon. She felt a strong sense of peace and joyfulness after the practice. 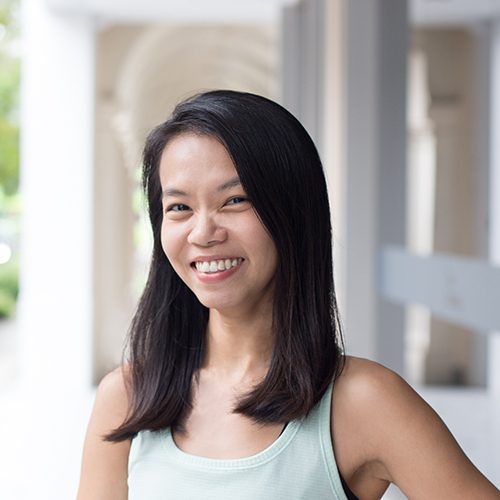 Unknowingly, it became a love affair and Aileen decided to take up yoga teacher training after coming back to Singapore. Aileen’s teaching style focuses on getting the basics and alignment right, as they form the foundations for a safe and strong practice. She hopes to help her students discover the peace and inner awareness that one can get from practising yoga, and that yoga is not just about asanas (postures). When she’s not teaching or practicing, Aileen is a laundry lady and floor manager; in short, fulfilling wife duties – with pleasure! At home, she can often be found terrorising her nephew (and teaching him things that his parents/grandparents disapprove of).